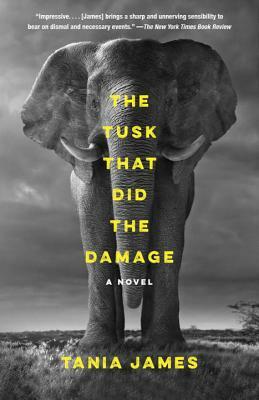 The Tusk That Did the Damage is an utterly contemporary story about an ancient and majestic elephant, and his dangerous connection to the land and the people around him. Orphaned by poachers as a calf and sold into a life of labor, Gravedigger has broken free of his chains and is terrorizing the South Indian countryside. Caught up in the violence are the studious younger son of a rice farmer drawn into the sordid world of poaching; and a young American documentary filmmaker engaged in a risky affair with the veterinarian who is her subject. In three intertwined storylines—one of them narrated by the elephant himself—Tania James crafts a heartbreaking tale of the ivory trade, exploring the porous boundary between conservation and corruption. It is a wrenching exploration of love and betrayal, duty and loyalty, and the vexed relationship between man and nature. Tania James is the author of the novel Atlas of Unknowns and the short story collection Aerogrammes. Her fiction has appeared in Boston Review, Granta, Guernica, One Story, A Public Space, and The Kenyon Review. She lives in Washington, D.C.